'Petra' has a bateau neckline and low back, billowing sleeves with detailed cuffs, full skirt and sumptuous train. The exceptional beading on this dress was inspired from an Art nouveau comb and is exquisitely detailed. The craftsmanship on this dress can only be appreciated when viewed up close. A show stopping gown. 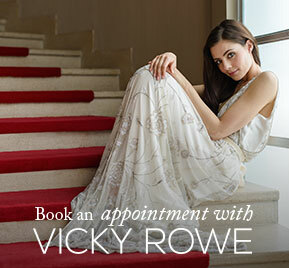 * Each dress ordered directly from Vicky Rowe is made to order using a fresh pattern to your measurements. Delivery for Petra is within 6-8 Months of consultation. Please read our FAQ's for more information. Email or phone for prices.